10 Reasons you need to start your day with Surya Namaskars! Surya Namaskar is a dynamic yoga exercise. Surya Namaskar essentially means salutations (Namaskar) to the sun (Surya). It implies that one must rise before the sun in order to do this exercise, and salute the rising sun. This is usually around 5 to 5:30 AM. Surya Namaskar consists of 12 postures that give your entire body a great shake up and an excellent workout. This exercise is good no matter what time you do it, but it is best done on an empty stomach to maximize its health benefits. When performed correctly, this exercise, composed of twelve poses, does not strain or cause injury. If performed in the morning, it relieves stiffness, revitalizes your body and refreshes the mind. Do it during the day and it will instantly give you a boost of energy and if you practice it after sundown, it helps you unwind and relax. The biggest advantage of practicing Surya Namaskars is the muscle workout it provides, but it also benefits joints, ligaments and the skeletal system by improving posture and balance. The limbs become symmetrical while the internal vital organs become more functional. 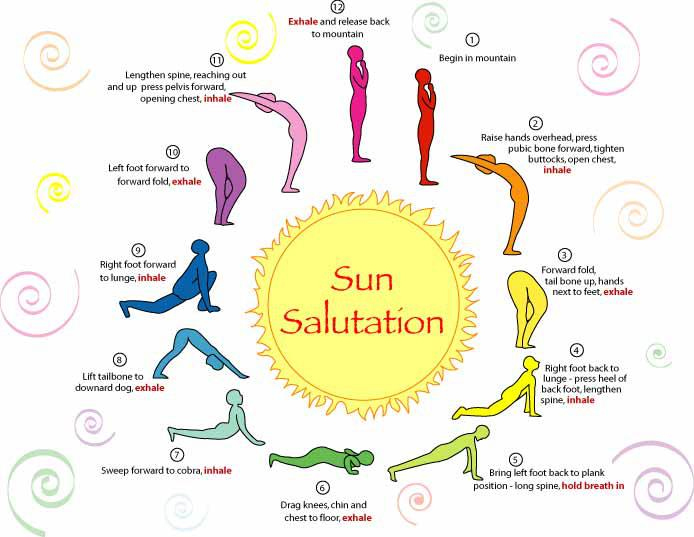 Practicing Surya Namaskar is beneficial for digestive health. Yoga poses increase blood flow to your digestive tract and stimulate the intestinal action known as peristalsis, so digestion is more efficient. Yoga also calms you, which in turn relaxes your digestive system and leads to more effective elimination. Forward bends increase the space in the abdomen and facilitate the release of trapped gases. These poses heat the front of the body and cool the back of the body. Surya Namaskar is the ideal exercise to cope with insomnia. Surya Namaskar practice calms the mind, thus helps to get sound sleep. If you suffer from insomnia, yoga is the answer. Through relaxing physical exercises, breathing techniques and complete relaxation, you can improve your sleep patterns without resorting to sleep-inducing drugs. Such drugs interfere with your body’s natural sleep cycle and can create psychological dependence and undesirable side effects. Surya Namaskars regulate irregular menstrual cycles. Practicing Surya Namaskar enables an easier childbirth. It helps to decrease the fear of pregnancy and childbirth. Metrorrhagia can be caused by a hormonal imbalance. The start of menstruation during puberty and the length and regularity of the menstrual cycle is controlled by hormones produced in an area of the brain called the hypothalamus, as well as by the pituitary and adrenal glands. Surya Namaskars boost blood circulation and help in preventing the greying of hair, hair fall and dandruff. It also improves the growth of hair. Regular practice of Surya Namaskar helps lose extra calories. It helps you to stay slim and fit. Practicing Surya Namaskars everyday is the easiest way to stay in shape. It stretches the abdominal muscles. Regular practice of Surya Namaskar helps you lose unwanted and excessive belly fat, and helps you get a flat stomach. Some of the asanas stimulate sluggish glands to increase their hormonal secretions. The thyroid gland, especially, has a big effect on our weight because it affects the body’s metabolism. Sun salutations add a healthy glow to your face, making the skin appear radiant and ageless. It is the natural solution to prevent onset of wrinkles. Overall, yoga is excellent for the skin and it can also help with blemishes and acne. Regular practice of sun salutations boost your endurance levels. It gives you vitality and strength. It also reduces the feeling of restlessness and anxiety. Surya Namaskars make the body flexible and agile. It improves flexibility in your spine and in your limbs. Surya Namaskars influence the pineal gland and hypothalamus to prevent pineal degeneration and calcification. It is most beneficial to practice Surya Namaskars early in the morning. The early morning rays of the sun are a rich source of vitamin D that is necessary to build strong bones and clear vision. Warning: People suffering from slip-discs, arthritis, heart attack or any ailment, including pregnant women, should consult a doctor before they start practicing Surya Namaskars. Categories: Beauty, Did You Know?, Live Green, Natural Mantra | Tags: Asanas, healthy living, Natural Mantra, Sun Salutations, Surya Namaskars, Yoga | Permalink.